The Hohner HAG250P 1/2 Sized Classical Guitar is an entry-level budget instrument for kids age 5 to 8. It is quite a popular model, mainly due to the price and its small size. When you are buying for a small child you don’t necessarily want to spend a lot of money on an instrument that you aren’t sure will be able to withstand some of the things that a child can put it through. If you are testing the water to see if your kids are interested in guitar, and don’t want to have to worry about the instrument being damaged this is a great model to try out. If your kids are taking lessons, you would probably want to invest in a slightly higher quality model. The construction on the body is decent, and the finish is okay. 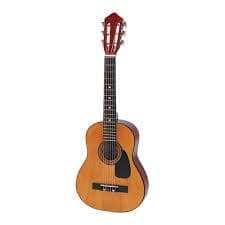 It has the standard classical styling of half nylon strings and half nylon wound with wire, which a lot of people prefer (to the six steel strings of an acoustic) for kids. The plastic pickguard takes away from the look of the body, and in person, it doesn’t look quite as nice as the pictures, although most children won’t notice this. When shopping for a guitar for a child, playability is probably the most important thing to look for. If it’s not fun and easy to play, your kids are not going to want to play it. The action isn’t the greatest on the Hohner HAG250P which makes it a little on the tough side to play. However, the size and weight make it a comfortable instrument for a child to hold, and the nylon strings make it easier on children’s fingers than an acoustic. In this price range, the sound you get from the Hohner HAG250P is quite good, although it does not hold tuning well. As with all nylon-stringed guitars, you will need to give it a week or so to allow the strings to stretch and settle. During this period you will need to retune it often. Also, note that 1/2 sized models do not have the same sound as a full-size model. The range is much smaller than a full size. The craftsmanship is pretty good for what it is, although it is very basic. I haven’t noticed any problems with the top, the neck, the frets, although there are obvious flaws in the finish of the one I tested, but not horrible for a budget brand. As I mentioned above, since it comes with nylon strings, you will need to spend a few days stretching the strings out and re-tuning it, after a couple of days the strings should begin to settle and hold the tune. If you are on a budget, you might be better off looking at the Lyons Classroom 1/2 Sized guitar. The Hohner HAG250P is okay if you are looking for something slightly better quality than a toy that your 5 to 8-year-old can mess around with. But if you are serious about your child learning guitar and if they are planning on taking lessons, spend a bit more money and get something a little better quality.